PUBLIC transport operators should not assume that commuters with no complaints are satisfied, going by the recent Customer Satisfaction Index of Singapore (CSISG) survey. Of the 97.9 per cent of public transport respondents who had no complaints, 16.8 per cent of this group felt that there was "no point" in complaining, and 4.8 per cent felt that it was "too difficult" to lodge a complaint. The Institute of Service Excellence at Singapore Management University (ISES) - which compiles the CSISG for various industry sectors - says that this means that complaint rates are not a good indicator of customer satisfaction. In fact, they could even mask brewing dissatisfaction, as the unhappy commuters who are not complaining may well take their grievances elsewhere. ISES thought that complaint and feedback management could be one aspect for public transport operators SMRT and SBS Transit to consider, even as they invest in upgrading buses and deploying newer trains. After all, commuter satisfaction with Singapore's public transport continued its downward trend, according to the survey's latest scores. From 2013 to 2014, CSISG scores for the Mass Rapid Transit (MRT) sub-sector declined. 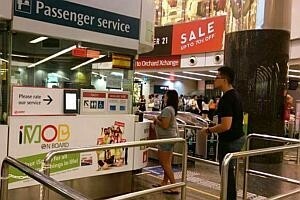 Customer satisfaction for SBS Trains slumped from 67.3 points to 60.3, and SMRT trains slid from 63.3 to 59.6. The MRT sub-sector also had the highest number of commuters refraining from complaining because they found it to be pointless or too difficult. ISES director Caroline Lim said: "As a company, you can't control how many complaints you get - but you can manage the complaints well." She suggested staff empowerment and redesigning service touch-points as possible solutions. "Customers want some form of acknowledgement," she said. "The resolution may not be immediate, but at least a sincere attempt to convince commuters that their voice is being heard. We do not want situations where complaints just fall into a black hole." Patrick Nathan of SMRT's corporate information and communications department said: "As part of ongoing efforts to improve our delivery of services to the public and enhance their travel experience, we encourage customers to provide their feedback and suggestions for us." The transport provider recently introduced pilot initiatives to enhance commuter experience and two new feedback channels. Last month, SMRT partnered NUS Enterprise to organise Singapore's first commuter experience hackathon, for entrepreneurs and developers to collaborate on providing new solutions that create positive travelling experiences. "We hope that the series of service initiatives and commuter engagement will help to improve commuter experience, while we continue to enhance service reliability and operational performance through our maintenance programmes," said Mr Nathan. In the latest report, ISES also found that the decline in satisfaction differed among different groups of commuters. Tourists' satisfaction retreated by 10.3 points year on year, more than double the five-point drop in local respondents' satisfaction score. The sharp decline in tourists' satisfaction turned out to be a major contributor to the lower overall scores for the MRT sub-sector this year. ISES felt that tourists have a different frame of reference, and so hold Singapore's public transport services to a much higher standard. They expect something different and much better when they are here whereas for locals, commuting is routine and they know what to expect. "Especially for tourists, you want them to have a memorable experience, so that the memory can spread when they go back to their home country. They might not be coming back to Singapore, but when they go back to their home country, good or bad, they will be spreading the word to their families and friends, and this can help generate a positive Singapore brand," Ms Lim said. She suggested that Singapore's MRT operators consider the different service touch-points that tourists will run into. For instance, could they work in collaboration with other transport providers to provide a more seamless experience? The latest CSISG report shows that other facets of the public transportation system can have a significant impact on customer satisfaction too. Train commuters who have more than one main mode of transport to work are generally less satisfied than those with only one main mode of transport to work, which suggests that satisfaction with MRT trains is dependent on the use of other modes of transports, or the availability of alternative options. This may be the biggest challenge to the operators, said Ms Lim. "Can one provider not just be aligned internally, but also align with other providers? This not just requires the organisation and other service providers, but even competitors to believe in the same cause." Marcus Lee, research director at ISES, advises business owners of large companies to start a measurement plan for customer satisfaction and hire a firm or have a departmentdo the measurement. He also advised business owners against biasing their measurements up. "It shouldn't be a feel good measurement. You want to do measurements to find out where you are doing well, and where you are failing your customers, because no one is perfect."